This bathhouse was designed as an autonomous entity, the ecological water management cycled to provide required water. 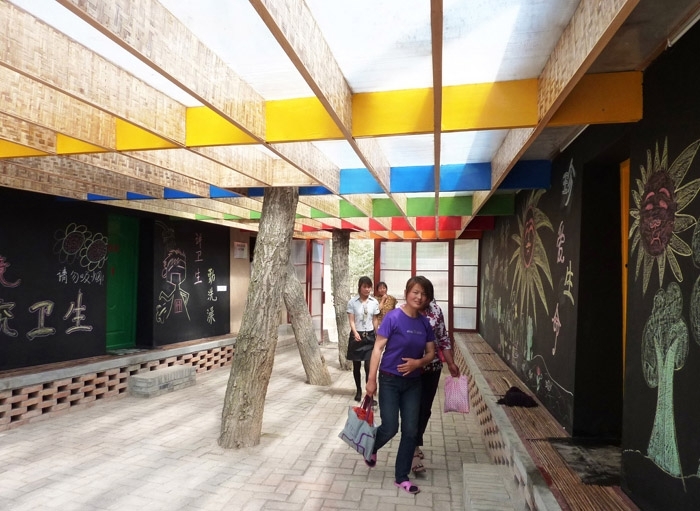 Shanmen, a village located in the mountains near Tianshui in Gansu Province, asked BaO architects and the Children of Madaifu association to help them build a small community bathhouse. The villagers and the schools had no possibility to wash in the town since there is neither public facility of any kind, nor private bathrooms in the houses. The precarious hygiene conditions are source of many discomforts, infections, diseases, plagues and even outbreaks of epidemics. The Bathhouse was conceived as a small scale public equipment that would help improve the sanitary situation of more than 5000 people including the nearby villages and approximately a thousand children. A key element of the building’s conception was the broader positive social impact that the project could have a town that lacks public and gathering spaces. The bathhouse is thus designed both as a functional building performing its duty and as a meeting place for villagers, a “public space” that acts as a community epicenter. The building is a prototype for an architecture that enacts civic consciousness and creates conditions for social progress, as well as a prototype for a sustainable development that doesn’t negate local environmental and cultural conditions but tries to use them to reinvent itself. The villagers and the schools had no possibility to wash in the town since there is neither public facility of any kind, nor private bathrooms in the houses. The precarious hygiene conditions are source of many discomforts, infections, diseases, plagues and even outbreaks of epidemics. A key element of the building’s conception was the broader positive social impact that the project could have a town that lacks public and gathering spaces. The bathhouse is thus designed both as a functional building performing its duty and as a meeting place for villagers, a “public space” that acts as a community epicenter. 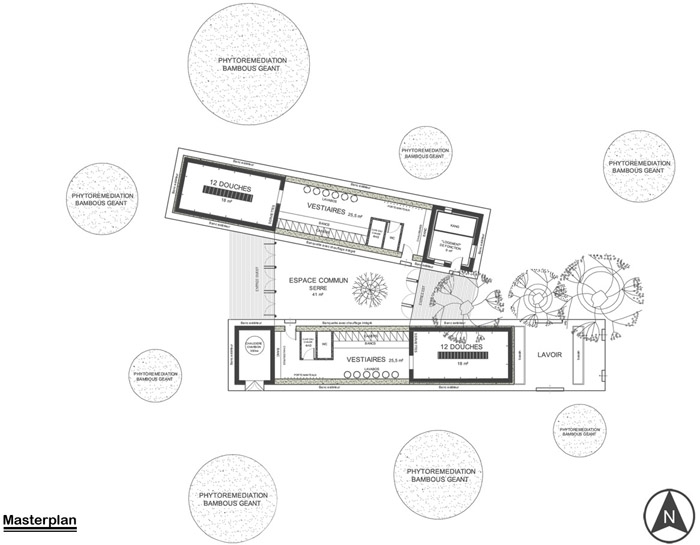 The project is split in two distinct buildings, one for men, one for women, that are linked in the middle by a shared space in the form of a greenhouse that utilizes passive solar energy. This “public” gathering space can be completely opened on both sides to become a half-inside/half outside buffer zone and to permit users to circulate in, through and enter or exit the building from multiple routes. Using the two bathing wings as structural walls, the generous spaces of the greenhouse were built for a very low cost with local materials and techniques. 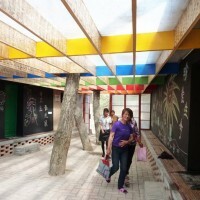 The two inverted blocks, with their roofs springing out from the central greenhouse, contain a green and a yellow bathing space for men and women. Each of them is organized along a sequence of entrance, where one change shoes or access bathrooms, locker room with washbasins and changing facilities, and a shower space containing 12 shower heads each. A full length window strip simultaneously brings light into the spaces and permits proper cross ventilation and steam extraction. The volumes are intentionally completely opened with simple details in order to guaranty easy maintenance and good hygiene of the spaces. 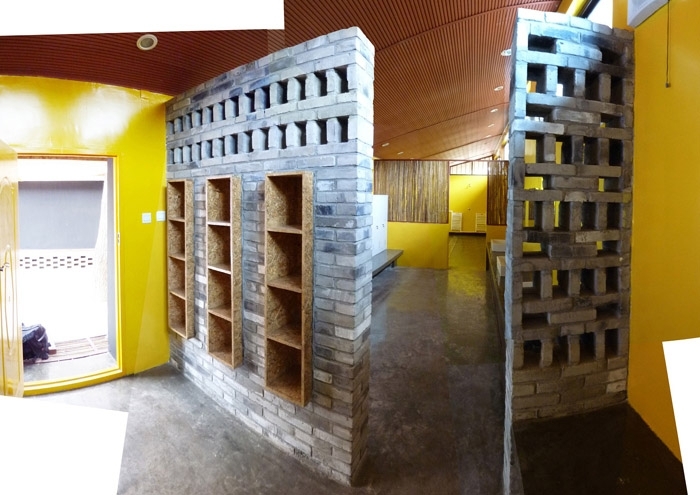 BaO’s intention of creating public spaces all around what had to be highly intimate buildings resulted in setting both shower blocks on a plinth higher than the site’s level. The new leveling permitted the creation of long benches surrounding the buildings that simultaneously furnish the greenhouse with seating on both sides. Next to the main entrance, both the roof and the plinth extend to shelter a small laundry space and outdoor water point. 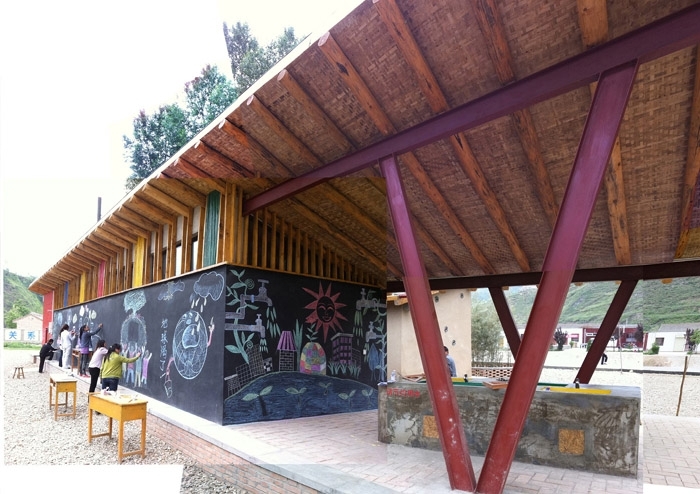 The cantilevering roof protects from rain and sun as well as creating a space of encounter for women and children. The facades of the buildings are conceived as active assets advocating public expression and a playful relationship with architecture. 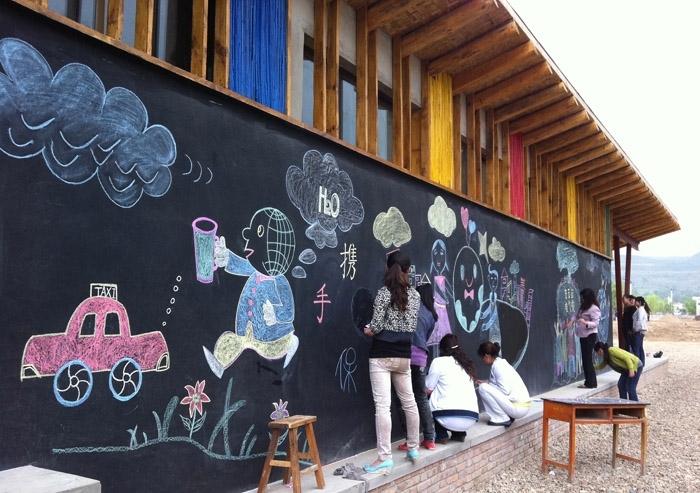 The blind walls surrounding the men and women blocks are covered with blackboard that enables to write information, signage or more simply to permit the school children to draw on, write on, play on and play with the building. The whole envelop of the bathhouse is thus continuously transforming and evolving with the interaction and creativity of the children. The bathhouse was conceived as an incubator triggering social, cultural, sanitary, environmental and economical mini-revolutions demonstrating that, even in the difficult context of urgency, it matters to go beyond simple problem solving and to try to propose alternative possibilities. For example, since neither public water supply nor drainage systems existed on-site, the whole bathhouse was designed as an autonomous entity. After being pumped from underground in a 8 meters deep well, the water is stored in a 20m3 tank that either supplies the roof solar collectors panels that provide free hot water at least 6 months a year or the boiler when solar energy is not enough. Moreover, in order to decrease budget and the impact to the environment, the main building materials were from the local materials.